I was so afraid to let go. I was afraid I would lose my edge, lose my drive, and my purpose. I feared I would be “missing out” on the exciting part of life. I didn’t want to hear that things were still happening and I wasn’t a part of it all. I knew in my heart, that in order for there to be more, there needed to be “less”. God’s way is always the beautiful flip side of the world’s way. Yes I knew that for years, but I still could not let go. Brother David spoke about an unbelievable clarity that he felt when he was given very bad news that first week of March. I think God spoke with His sweet voice of clarity all throughout our community that week as we tried so hard to process this unbelievable truth. I don’t know about others, but my family experienced a shift in momentum after his powerful message. A slow compression of life’s brakes was being put on. We found ourselves sitting at the kitchen table talking, sitting on the stairs talking, and later piled up on the bed talking that night. We talked about our feelings for David and his family and we talked about our own lives with a much softer tone. I remember every second of that day. We were so present in it. But I kept thinking…although we can pray fervently, we can’t change what’s happening in David’s life personally, and that is painful as we think about all that this man has done for us as a church, as a community, and as a family. But… what we can do is allow God’s purpose of it all to be fulfilled by allowing it to change us. What we can do is take every lesson, every encouraging word he’s ever shared with us and truly, finally, and fully apply it all to our lives! David joked that Sunday morning, “Don’t waste my cancer.” Let’s not! The following Monday, when one of my busiest clients announced that they were closing their doors, I felt that new shift in momentum even more strongly. I stopped and just took a deep breath. For the first time, I resisted the need to restlessly jump on the phone and fill their space with new clients. For the first time, it simply didn’t matter. Instead I went to a quiet restaurant and simply tried to absorb the moment. With a veggie wrap and a cup of hot tea, a warm, relaxed peace and sense of relief began to surface. I’m pretty certain my reaction would’ve been much different the previous week, but that Monday, the news came as a gift. 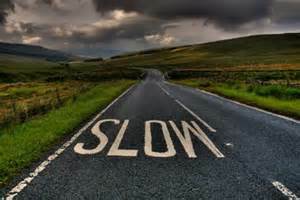 Life in our family would finally be slowing down after all these years…maybe now we’ll see with God’s clarity what that “more” is. I heard this once and it’s oh so true. 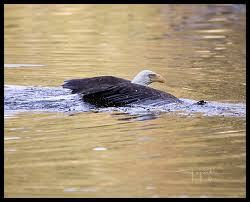 Sometimes we are eagles choosing to swim across the river. We hold ourselves down and trudge and struggle through because that’s what we see the school of fish doing. Then one day, by or own choice, or perhaps not, we let go… and we realize, in an instant, that God’s plan for us was soooooo much bigger as the wind carries us to places we never imagined. 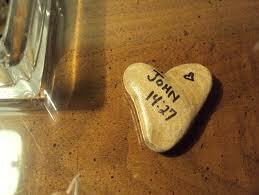 John 14:27 “I am leaving you with a gift-peace of mind and heart. And the peace I give is a gift the world cannot give. So don’t be troubled or afraid. Although it’s been a few weeks, our family is forever changed by this. If you would like to hear an incredible message of faith and courage, watch this taping of Pastor David Landrith, Senior Pastor at Long Hollow Baptist Church in Hendersonville, TN. You will be changed. Beautifully said. I needed to hear this today. Thank you! This is so well said. 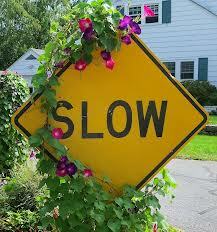 We all need to slow down. Thank you for sharing.